When I was in high school, I had a very good English teacher. Well, I also had a very bad English teacher, but that's beside the point. * In Junior year of high school I had an excellent English teacher who taught us something I didn't really get at the time but which I have remembered ever since. In a true war story, if there's a moral at all, it's like the thread that makes the cloth. You can't tease it out. You can't extract the meaning without unraveling the deeper meaning. And in the end, really, there's nothing much to say about a true war story, except maybe "Oh." True war stories do not generalize. They do not indulge in abstraction or analysis. Narrative relativism. The idea that a story can be true without being, exactly true. And the idea that for all we tell stories and try to make meaning out of the seeming chaos that is our lives, we never have the whole story or all of the information and so the stories we make for ourselves are comforts wrapped in lies. Our feeble attempts to form stories out of wars and tragedies and devastation only tend to highlight how very little we actually know or understand. Real life doesn't abide by story structure, and analysis of themes will not get you very far. This is hard for me to deal with sometimes. I like story structure. I make my living by it. Narrative relativism bothers me because it suggests that what I'm doing is really just spitting into the wind, that by using stories to examine human lives I'm trying to reverse engineer a lead balloon. I hate the idea that we are all chaos in the wind, and frankly, I don't believe it. Not really. No matter how much I try to embrace the randomness of life, I remain certain that there is a real story being told here, even if I have no idea what it is. But what does all of this mean in terms of the stories we tell that are, hypothetically, based in truth? How can you actually tell a true war story? Will there always be some element of glossing over or some little piece that has been manufactured in order to make the narrative more satisfying? More importantly, is that okay? I've been thinking about this a lot lately because I just finished rewatching HBO's Band of Brothers miniseries. If you've not heard of it, it's a "based on a true story" retelling of the exploits of first paratroopers in World War II. 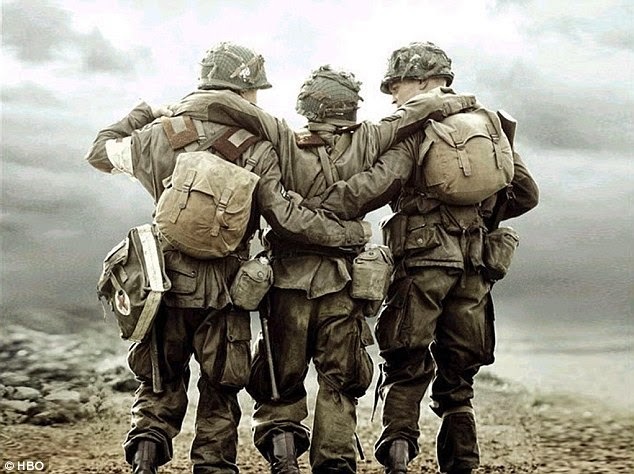 Specifically Easy Company, a division of the 101st Regiment, a group who were well known for seeing some of the most ridiculous action of the war. 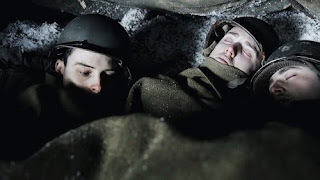 The series is based on a book by Stephen Ambrose, also called Band of Brothers, that gives as accurate as possible a retelling of Easy's time in the war, based on military reports, historians, and interviews with the surviving soldiers. The miniseries even includes little snippets from those interviews at the beginning of each episode. It is, as far as anyone can tell, the closest thing we've got to a true war story. 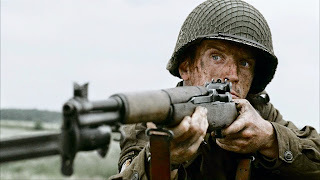 But for all that Band of Brothers is absolutely the closest anyone could make it to a "true" war story, there's something that always bothers me about it. I mean, it's also a television show. It has narrative structure and arcs and freaking plotting, so how true can it be? I know that some of this is achieved by just leaving bits out and choosing to focus on other parts so that the story seems to flow more naturally, but it's still confusing. I don't know if I really think of Band of Brothers as a true story, but I also don't know if I really think of it as fiction either. Whichever it is, I do think we can all agree that it's very good. Following the men of Easy Company from their training days in Toccoa where they learned to jump out of planes and come down fighting to the very end of the war as they tentatively waited to see if they'd be deployed overseas, you really come to know and understand these characters. Or historical figures. People? It doesn't hurt either that the show features some of the best actors of the past ten years in their up and coming roles, as well as some character actors who seriously need more work. Michael Fassbender, James McAvoy, Tom Hardy, and Andrew Scott all make appearances, as do Simon Pegg and David Schwimmer. Damian Lewis is clearly the breakout star, because this was the first time anyone outside of England saw him (and his American accent is spectacular), but Ron Livingston clearly holds his own. Seriously, watching this was almost painful for me, since I spent the whole show in a dither of putting names to babyfaces. Andrew Lee Potts, Donnie Wahlberg, Eion Bailey, Matthew Settle, Michael Cudlitz, Neal McDonough, Richard Speight Jr., Kirk Acevedo, Marc Warren, Jamie Bamber, Colin Hanks... I mean, if nothing else, the sheer size of the cast ensures that we all recognize at least a few of the names off that list, and they're all amazing actors who need to do more things. But that's beside the point. The actors and their phenomenal performances are only one small part of this show. There's also the gorgeous cinematography, the costumes and set dressing and sheer realism of the sets, the writing and how the story was framed. It's a masterfully made miniseries, and I highly recommend it to anyone who likes good drama and has a strong stomach. So it's not that there's something really wrong with the show itself. From an objective standpoint, it's excellently made and as honest as possible. It's just that something in me twists every time I try to understand this. Is it history? Is it fiction? Where should the line be drawn? And, for all that it's a compelling drama, I can't forget that these are real things that really happened to real people. Probably. Sort of. Maybe? Perhaps part of the frustration for me, as a film and TV critic watching this, is that I feel like I can't really criticize it. I mean, what am I going to say? "Your real life experiences were not properly cinematic and narratively entertaining. I found the dramatic portrayal of your trauma to be insufficiently emotional. Your worst nightmares lack story structure." No. I'm not going to say that, because I'm not a terrible human being. At the same time, however, this is a show and it deserves to be criticized as a piece of media. Especially as a piece of media that we all instinctively consider to be really accurate. 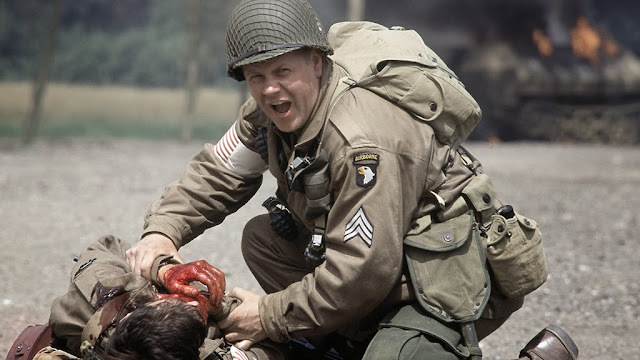 If we're going to hold up Band of Brothers and shows like it as the gold standard of war stories, then they deserve examination. Just, what kind of examination? Do we want more literalism or less? What is more beneficial to our culture and society? I'm asking all of these questions because I don't have the answers, but I know that they're important. Especially on days like today, it's worth taking a moment to really consider the way we structure narratives around true events. Events like World War II or the American Revolutionary War or September 11, 2001. We have framed stories around those facts to help us understand and make sense of them. But the stories we've created may or may not be beneficial and they may or may not be true. World War II, in my opinion, occupies a strange and slightly unsettling place in our collective history as Americans. It's the war everyone points to as a just war, but I know that, in public school education at least, the narrative they construct around those events sometimes fails to take into account the whole story. It makes the Nazis out to be ultimate evil and the Americans out to be the unquestioned heroes. We gloss over the elements of truth that don't fit that story. We ignore the way that poverty and the destruction of World War I left a hole in Germany that Hitler could fill with his hatred. We gloss over the United States' history of interning Japanese nationals in our own borders. We pretend that the atrocities of war were one sided, that we came into the war for truth and justice and freedom. We forget that there was a strong and loud contingent in the US of people who thought we ought to side with Germany. We conceal the fullness of the truth to make ourselves feel better. To make a story that makes us feel safe and good. I don't believe in that. And part of why I actually like Band of Brothers is for how it doesn't try to sugarcoat it. I mean, it does a little, but it still lets the men be human beings who sometimes do bad things. Who aren't perfect and good and angelic. Who shoot unarmed men and suffer from PTSD and loot German silver and cover up for each other. I think basically what it comes back to is that quote up top. The only true war story is one without generalizations or moralizing. A true war story is one that just happens, like war, and that grabs you by the guts. Because there's no way to ever tell a true story in that super factual way. We're all humans filtering the world through our limited perspectives. No, the true war story is just the one that is true enough, that says what it was like in that moment for those people. Sometimes that's as good as you can do. *Technically speaking, the breakdown came out to two bad teachers and two good ones, so I don't feel that bad about it. I mean, what am I going to say? "Your real life experiences were not properly cinematic and narratively entertaining. I found the dramatic portrayal of your trauma to be insufficiently emotional. Your worst nightmares lack story structure." Hm. I wish some of Woman in Gold's critics had asked themselves that question. YES. ALL OF THE YES.